This picture makes me sad. It makes me sad because it no longer looks like this. We had a brilliant plan to redo the garden. We pulled everything out to make room for new plants. And then we moved the chickens. Dirt and birds. That’s what I’ve got. And the trees are a bit bigger now. There are only a few token shrubs left, some of which look better than others. We don’t even have any weeds. Have I mentioned how good chickens are at weeding? This is just a portion of our yard, our “entertaining” area where we can seat a lot of people. The patio is actually more square footage than our house to give you an idea. The trees moving from upper left, across and then down to lower right are: Arkansas Black apple, Manzanillo olive, Arbequina olive, random orange tree, pomegranate, Karp’s Sweet quince, Johnny Appleseed Apple, Illinois Everbearing mulberry, Indian Free peach, Jubileum plum. The gate to the right of the chicken run has actually been removed so that the birds have access to the large orchard area near the garden. I’m not so concerned with that area right now as I just want to focus on this main part of the yard. The first area that people see when they enter our backyard. A couple of months ago I was sent a book to review. I was so excited to get this book as it was EXACTLY what I needed to inspire me to get moving on the garden. 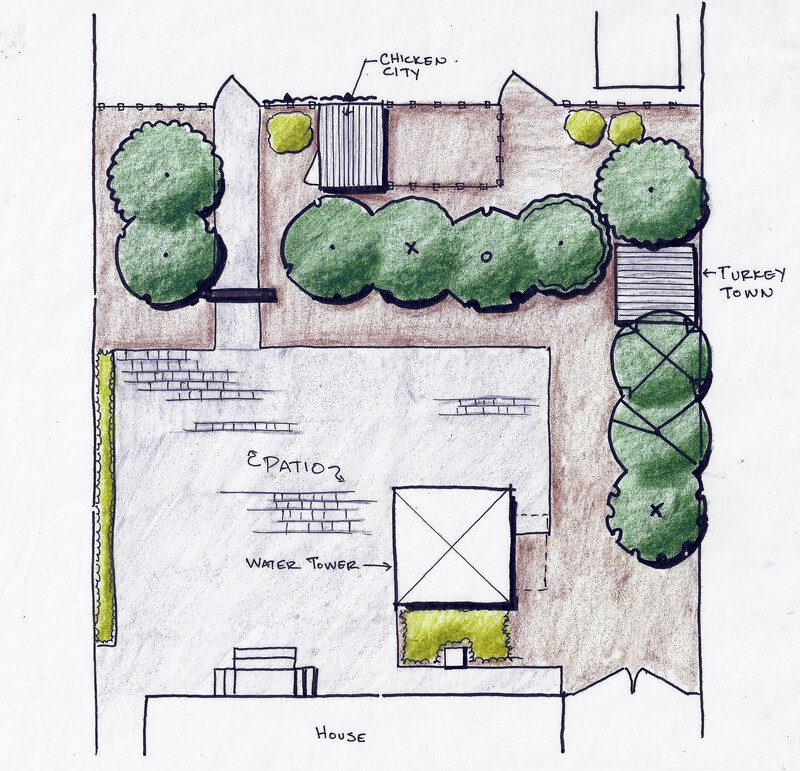 Free Range Chicken Gardens: How to Create a Beautiful, Chicken-Friendly Yard by fellow designer Jessi Bloom was going to be my garden savior. This is definitely a book you can judge by it’s cover. It’s got beautiful photos – full page photos – throughout with tons of information including basic chicken care, how to build a coop using different materials (plus the pros, cons, availability and relative expense of those materials), and of course what plants you can and cannot use around chickens. 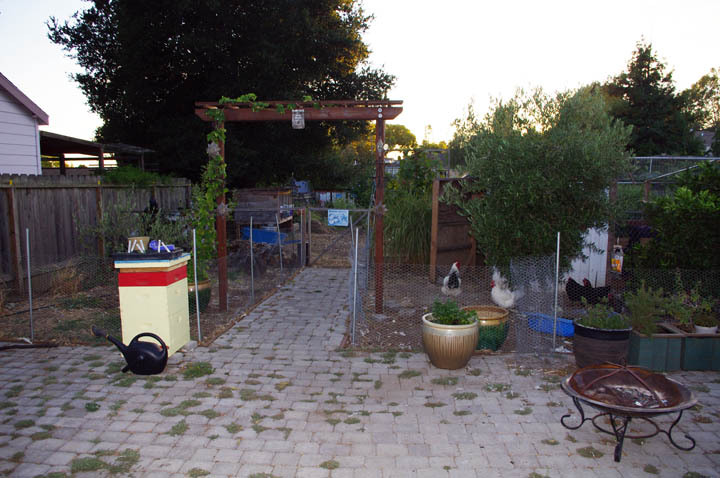 It also features different chicken gardens throughout the book which is great. I like seeing what other people are doing with their gardens. As designers we take a lot of inspiration from what other designers do. We don’t copy but we are inspired by different ideas and then change them to make them our own. Our book shelves are lined with relevant topic books that we go through and tag the ideas that we like for each project. Then we work on bringing all the things we like together into a design that flows. This book is perfect to add to my shelf because it deals with a lot of plants I don’t normally use – perennials. I work mostly on large projects where we need bulletproof plants that don’t die back every year so my experience using perennials is a bit limited. 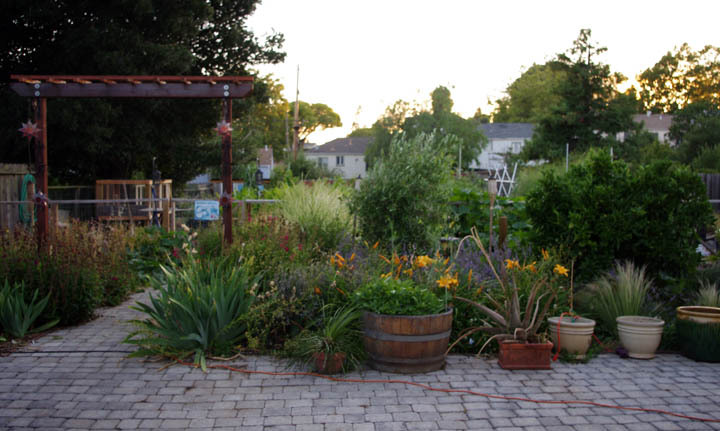 Next week I’ll unveil the plan I have for the backyard along with a plant list that will use chicken-friendly plants. I’ll also be incorporating bee-friendly, edible and medicinal plants as well. A following post after that will be the project of putting the plants in (though this might be over a few weeks because I’ll need to source them through wholesale nurseries. I’m really looking forward to this project. Just requested the book from my library. Eager to see the pictures and the plant lists! Good luck with your planning.